Abbott Ridge looks like a formidable climb from the meadow, but the trail switchbacks through the flowers and up the gentler backside. The route reveals itself as you move through the boulders. The Abbott Ridge Trail in Glacier National Park switchbacks up through mountain forests and alpine tundra, ending on a scenic narrow ridge. With a return distance of 13.6 km and elevation gain of 1029 m, the trail is an excellent workout. Your efforts are rewarded with breathtaking views of the surrounding peaks. The trail even has a surprise lake at 1700 m, offering a nice break spot with a side trail to a viewpoint. 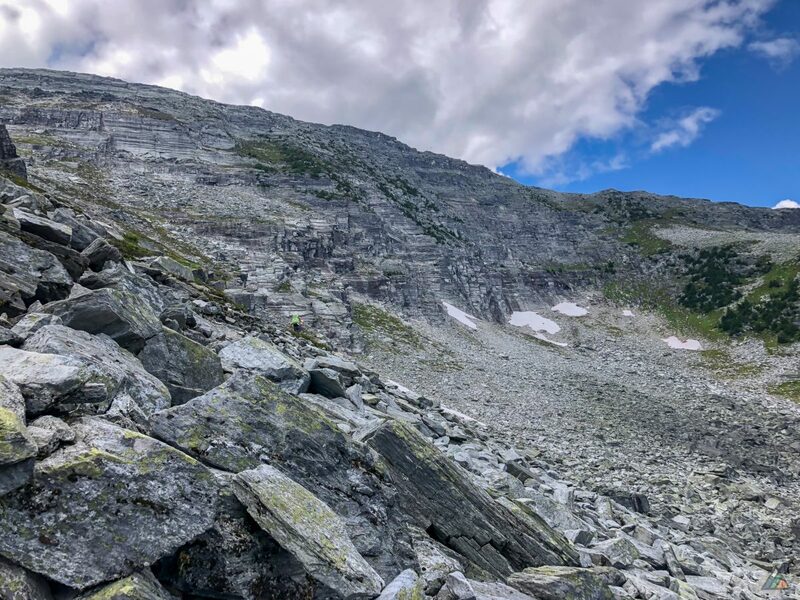 If you only have time for one hike in Glacier National Park, and you have the energy and stamina, Abbott Ridge is your classic Columbia Mountains day-trip. Sights include the Asulkan Valley, Asulkan Glacier, Mount Sir Donald, Vaux Glacier, Mount Abbott, Eagle Peak, Uto Peak, Illecillewaet Glacier, and more! The views of the surrounding mountains get increasingly better as you hike up the Abbott Ridge Trail. 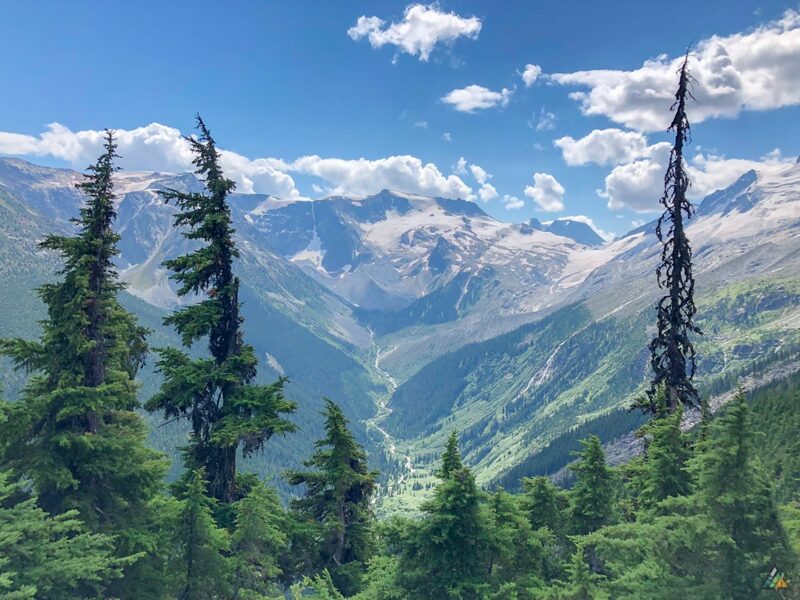 A side-trail lookout near Marion Lake offers an excellent view of nearby peaks and Rogers Pass below. The Meeting of the Waters Trail is one of the shortest walks in Glacier National Park. A historic sign near a Parks Canada bridge marks the spot where the Asulkan Brook joins the Illecillewaet River. Parks Canada daily admission fees apply in Glacier National Park. These may be purchased at the Rogers Pass Discovery Centre. You may choose to purchase a Discovery Pass which allows for unlimited annual National Park admission. 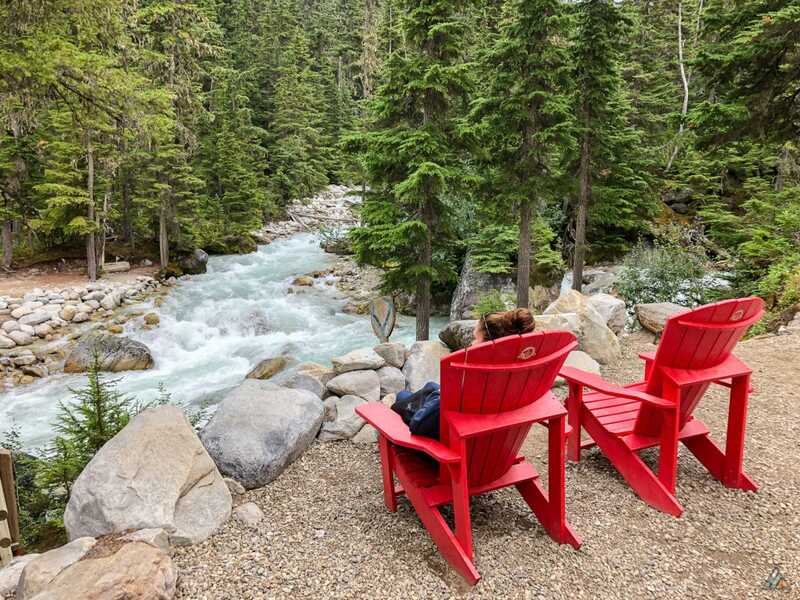 Parks Canada promotes a Red Chair Program to highlight points of interest to relax and reflect. These chairs are fun to locate and capture a memorable photo. Parks Canada maintains three front-country campgrounds near the summit of Rogers Pass: Illecillewaet, Loop Brook, and Mount Sir Donald. All campgrounds are first-come-first-served (FCFS). Illecillewaet (60 sites) and Loop Brook (20 sites) have similar amenities: flush toilets, kitchen shelters, and food lockers. Illecillewaet Campground is a short distance from the ruins of the Glacier House Monument and the start of most Glacier alpine day hikes. Illecillewaet Campground also offers a staffed welcome station and interpretive boards. This is our preferred campground to stage out of. Loop Book is equally lovely, but smaller and a few km further from the Glacier House trailheads. We have not stayed at Mount Sir Donald. Looking back over the boulder bowl, we see Mount Sir Donald and the Illecillewaet Glacier. The last few snow patches are pink and blushing with the algae Chlsmydomonas nivalis. With Mike guiding a group on the Nootka Trail, I found myself solo for August long weekend. Fortunately, my best girlfriend Victoria was also free! We decided to seize the opportunity to explore Glacier National Park together. The weekend was a “go for it and see what happens” kind of experience. BC Day was the busiest tourist weekend of the year. We had no reservations and little hope for a front-country campsite in the park. I flew to Kelowna after work on Friday night. We rose early on Saturday and drove straight to Glacier, arriving in the Rogers Pass area at campground “checkout time.” Our first choice was Illecillewaet Campground, but it was full. Fearing we would have to backtrack to a Revelstoke motel, we drove 2 km to Loop Brook Camp for a last chance effort. Three sites were unoccupied! Incredulous, we did a risky drive-around to evaluate, then settled on an open corner site away from the washrooms and picnic shelter. Within 20 minutes, the other sites had filled. The moral of the story: never assume a worse case scenario! The chance of getting a site was low, but it wasn’t zero. Our persistence and early effort paid off and we staged for two days of premium alpine day hiking. We checked conditions with the rangers at the Rogers Pass Discovery Centre and committed to Abbott Pass and Hermit Trail. Victoria and I don’t get to see each other too often these days, so hiking together on a summer weekend in a world-class park was exceptional. The Abbott Ridge Trail begins just beyond the ruins of the Glacier House Monument. Our starting elevation was about 1260 m. Once we passed the trailhead sign, we started the strenuous uphill hike at 0930 h. The air was cool and we enjoyed shade while we warmed our muscles. After slogging up through the forest, we took a snack break on a breezy lookout near Marion Lake (1700 m). This beautiful subalpine lake had a surface like glass, reflecting the stony rubble in the background. Before long we passed a trail junction which indicated a short-cut via a steeper trail. We opted to stay to the left and take the long, sweeping approach up. As we got closer to breaking treeline, the views got more spectacular. The Asulkan Valley stretched deep and green to our left. Soon we reached a boulder bowl and hiked around the contour. We could hear pikas in the rocks, but did not see any. The switchbacks continued up a rubbly meadow, with a clear view of our Abbott Ridge objective. The trails were excellent and well-maintained. There were no snow fields to cross. All we had to do was continue up the well-engineered path. There were lots of other people tackling Abbott Ridge. Some folks had off-leash dogs who probably scared any animals. Wildflowers dotted the landscape, including my favourite western anemones. After we cleared the meadow, the trail wound around to the backside of the ridge for the final “ascent.” We were treated to a few more switchbacks before arriving at the Parks Canada “End of Trail” obelisk. This zone was clustered with people, so we hiked a bit further along the ridge to a chunky rock for lunch (2270 m). Excellent clear views rewarded our effort. I could see the end of Glacier Crest Trail where I had visited a few years back. We spent about an hour up there, soaking in the panorama and sun rays. For our descent, we stayed to the left and took the steeper trail down to that junction and made a lollipop. Trekking poles were super helpful during the downhill. After hours of silent grinding, we found ourselves at the Glacier House Monument. A great day behind us, we made our way back to camp to put on sandals, re-hydrate dinner, and plan the next day! Marion Lake (1700 m) is a surprising and beautiful feature on the way up to Abbott Ridge. The surface was flat and mirror-like, reflecting the jumble of rocks and subalpine trees on the far shore. Expansive views open up as the hiker ascends up the Abbott Ridge Trail. The green Asulkan Valley extends up towards the Asulkan Glacier; there is a hut up there somewhere! After breaking the tree line on the Abbott Ridge Trail, the terrain transitions to alpine boulder fields. We opted to take the long way round and experience this sweeping, jumbled bowl or rock and lichen. The Abbott Ridge Trail is a long, strenuous climb though subalpine and alpine terrain. The trail is in excellent form, but frequent hydration breaks are still required; Victoria finds a premium seat! The Abbott Ridge Trail passes through an alpine meadow full of vegetation and wildflowers. The fluffy western anemones were dominant, their yellow hairs blowing in the wind. Custom trips give us the opportunity to design a special trip for your group. We will create an unforgettable adventure suitable to everyone’s objectives, and physical abilities.